Yoga requires a lot of our wrists and hands. Not grabbing or picking things up like we do in daily life, but a lot of weight bearing activities on our hands and wrists. If that’s an arthritic hotspot for you, that’ a problem. 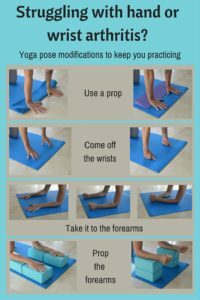 The infographic above covers a bunch of ways you can still practice yoga with arthritic hands or wrists. Option #1 – Change the angle of weight bearing on your wrists. You can do this with a wedge or by folding back the front edge of your mat. Option #2 Take the weight off the palms. The first picture shows cupcake hands which requires some arm strength but provides a nice practice variation. Coming to your fists prevents any strain from finger extension. Moving out of all fours in either of these adaptations is more problematic. Down dog in cupcake hands is very demanding of the fingers and requires quite a bit of strength. Staying on your fists in down dog is not proper alignment for wrists and you shouldn’t do it. Option #3 – Remove the hands and wrists from the equation. If you come on to the forearms, the hands and wrists are non weight bearing. Your placement with your hands is up to you based on what feels good and where you’re going as you move through your practice. Note that coming up into a forearm down dog (dolphin variation) requires a lot of upper body strength and length in the triceps which women tend to lack. It’s a great way for us to practice because of those points but respect yourself and build up slowly. Option #4 – Prop the forearms to keep your back level. This is kinder to the hips, less weight bearing in the elbows and builds a different level of body awareness. I hope these variations provide you some practice options. Arthritis in your hands and wrists doesn’t have to keep you from practicing. Yoga for arthritic hands is possible as long as you can take a moment to pause and focus on yourself. I speak from experience. Namaste. Another option for yoga for arthritic hands and wrists is to take your yoga practice into the pool. Read my post on Research on Aqua Yoga for Arthritis. Watch the webinar I hosted on Aqua Yoga for Arthritis. Another infographic on Aqua Yoga Sun Salutations. Aqua yoga does not require a lot of arthritic hands. If you’re looking for ways to stay out of pain, find confidence and contemtment despite arthritis, join my aqua yoga online eCourse. Enrollment opens again in July. Sign up for priority enrollment and early bird discounts.